Saccharomyces boulardii is a true probiotic yeast superstar, the special forces probiotic of the probiotic world. It has potent beneficial effects on your body, without the risks associated with some other probiotics. It's not a yeast to be afraid of, unless you're allergic to yeast, of course. Precautions have to be taken if you have any type of catheter, port or IV, or are immune-compromised, but if that situation applies to you, then please check with your doctor before using any probiotics. This probiotic yeast used to be known as a separate species from Saccharomyces cerevisiae, but researchers now say that boulardii is very similar to cerevisiae, so it is a strain of cerevisiae. That would make the technical name for it Saccharomyces cerevisiae strain (or “variant” as it is sometimes called) boulardii. But since you will see S. boulardii on product labels, that’s what I use here. S. boulardii is similar to S. cerevisiae in that both lack the ability to penetrate into tissues like Candida species can, so they are not invasive (so not scary like the fungi listed on the Saccharomyces page). S. boulardii is unable to form spores, so the chances of translocation to other parts of the body are reduced, too. However, since it's a yeast, anti-fungal medications can wipe out this probiotic yeast. One of the biggest advantages to using S. boulardii, especially when taking antibiotics, is that it is not affected by antibiotics since it is a yeast. Therefore, it can help to keep pathogenic (disease-causing) microbes and yeasts such as Candida from overwhelming your body when the antibiotics kill most of the good bacteria and most, but not all, of the bad bacteria in your GI tract. There many specific conditions which S. boulardii can benefit which are explained in my ebook, "Saccharomyces boulardii, The Special Forces Probiotic." Sorry, but the ebook is currently being updated as of April, 2018, and is not for sale. Please check back. What Are the Side Effects of Saccharomyces boulardii? Side effects of thirst and constipation are rare and insignificant in healthy individuals and last only a few days. Diarrhea may occur as the population of your flora changes. 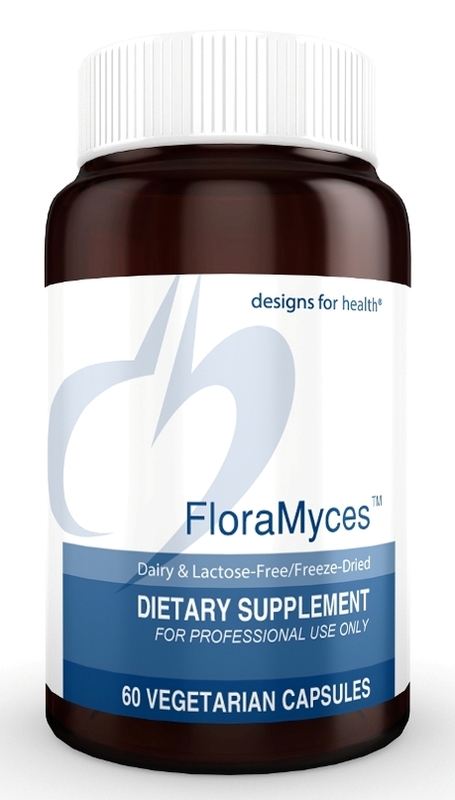 For an S. boulardii supplement which does not have a lot of unnecessary ingredients in it, Designs for Health's Floramyces is dairy-free, lactose-free, non-GMO, is not made with gluten and does not have to be refrigerated. You can find that in my dispensary. Here is where you can find other S. boulardii products. For suggestions on how to start taking it, go here. To go back to the general page about Saccharomyces, see this page. I research studies and share my clinical experience to write this free site to help you find solutions to your problems. As part of that, I recommend products and services that I genuinely believe will be of help to you. If you click on a link to a product/service, I may receive a small commission if you buy something. The item does not cost you more. Thanks for visiting this site! If you've enjoyed reading this page or have found the information to be useful to you, please "like", tweet about it, or share it so others can benefit, too. You can leave comments below via Facebook or Disqus. I'd love to hear your opinion about what you just read. Leave me a comment in the box below! Other commenting options follow the Facebook comments. If you are one of my many readers without a Facebook account, you can still comment. Disclaimer: Please note: By law, I cannot provide any personalized recommendations for your specific health concern on this site. The information contained in this site is educational in nature and is not intended as diagnosis, treatment, prescription or cure for any physical or mental disease, nor is it intended as a substitute for regular medical care. Consult with your doctor regarding any health or medical concerns you may have. Subscribe to my monthly newsletter and receive a free copy of "The Quickstart Guide to Probiotics." Some competitors of SBI (Solo Build It) are posting fake negative reviews of SBI. If you are considering creating your own website business, or if you have a brick-and-mortar business but want an online presence, I highly recommend SBI! © Copyright 2012-2019 by Jo Panyko, PowerOfProbiotics.com, a site of Chrysalis Nutrition and Health, LLC. All rights reserved. No reproduction permitted without expressed written permission from the author/publisher.